Tonight the Chicago Bulls (22-59) close the book on 2018-19 season in the very same spot they opened it by visiting the City of Brotherly Love to take on the Philadelphia 76ers (50-31). The 76ers came out on top in the first and third meetings with the Bulls, while Chicago pulled-off an exciting 108-107 upset in front of their home fans behind Zach LaVine’s 39-point scoring night in the second get together. It was the 10th time this season LaVine had scored 30-or-more in a game. The Bulls top scorer this season hit 14 of 26 shots overall, while center Robin Lopez added 19. The win that night also snapped a two-game Chicago losing streak. For the 76ers, former Bulls forward Jimmy Butler notched 22 points to lead Philly, while Ben Simmons added 18 points, 11 rebounds and seven assists. All-Star center Joel Embiid skipped the game due to a sore left knee. The 76ers come into tonight locked into the No. 3 seed in the East after losing, 122-99, to the Miami Heat near South Beach yesterday evening. Recent signee Greg Monroe led the way for Philly with 18 points off the bench, while Ben Simmons added 16 and Jonathan Simmons chipped in 14. The Sixers rested Embiid again, as well as starting shooting guard JJ Redick, with the idea of preserving them for the playoffs that will tip-off this weekend. Despite the loss to the Heat, Philadelphia still posted a 50-win campaign this year for the second consecutive season. For this evening’s contest 76ers head coach Brett Brown hinted last night that Embiid, Redick, Butler, Ben Simmons and Tobias Harris probably will not play against the Bulls, again for precautionary reasons. Chicago hits the hardwood one last time looking to cap their season with a second upset over Philly after falling last night at the United Center to the New York Knicks, 96-86. Ryan Arcidiacono paced the Bulls with 14 points, while Shaquille Harrison added 13 and Robin Lopez chipped in 12. 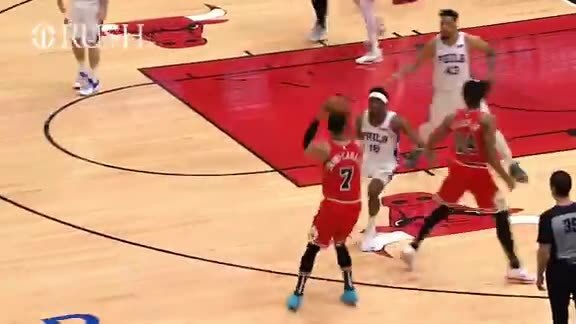 Once again, Chicago was without the services last night of regular starters Zach LaVine (right patellar tendonitis), Otto Porter Jr. (right shoulder strain), Wendell Carter Jr. (thumb surgery), Lauri Markkanen (general fatigue and irregular heartbeat) and point guard Kris Dunn (back strain). As a team, the Bulls shot only 36 percent from the field. It was even uglier from distance as Chicago was just 7-for-22 (31.8%) from behind the arc. It was the Bulls’ 12th loss in their last 14 games. In order for them to pull off a victory this evening the Bulls have look to play fast and free from the moment they step on the floor. Offensively, Chicago needs to move the ball, freely skipping it from player-to-player and from side-to-side to get everyone involved. They have to force Philadelphia’s defense into constantly shifting and scrambling in guarding both the perimeter and down low near the basket. Chicago’s ballhandlers need to crank up the pace of the game by doggedly going on the attack at every opportunity. They also have to be willing to pass the ball to an open and waiting teammate outside who may have a clean look at the basket from behind the 3-point arc — and they must hit those open shots far more consistently than they have most recently. Collectively, the Bulls must always come to work with a gritty attitude and not be afraid to get physical, especially when it comes to battling for control the paint and also rebounding the ball. Offensively and defensively, the Bulls must take advantage of their wealth of athleticism, outworking and outhustling the Sixers at both ends of the floor. A major key to winning this evening will be Chicago’s ability (or inability) to establish a fast pace, getting into transition early and often to score easy, uncontested baskets before the Sixers’ defense has time to adjust and set up at the other end of the court.